What started as a simple idea back in spring, has taken on an unstoppable momentum and has grown into an extensive method, becoming more sophisticated with each development. 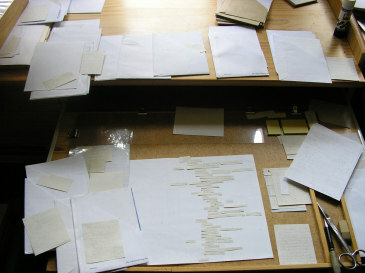 The original inspiration for one idea on one piece of paper came from Andrew Durham's Unfolder Wallet (from the internet archive), and subsequent modifications and additions were inspired by many hours of surfing productivity web sites (and not getting anything else done), not least the vast amount of information that exists on Getting Things Done . I had many breakthroughs by reading about various organising systems, which I adapted to the Slip Method. I also noticed a number of issues and questions that were frequently raised, some of which I had to address myself, and have come up with at least a few solutions, some of which may help you too, or be an inspiration for further development. But more on that later. Being the ultra thrifty type, I came up with some ideas which can save resources, especially in the long run. My concern for the environment, my joy of sharing ideas, and my need to earn money have all contributed to the idea of writing a book about the SM, for indeed, there is enough material to write one, at least a booklet. So here I am, serialising the draft whilst I am writing it. Why "publish" now? For the above reasons, plus I would like some feedback before writing the final version, and, well, I am a tease. The finished book, perhaps chapters - as they are ready, will be available in PDF format. Please bear in mind, that the book is written for all levels of skill. Veteran seekers of the Holy Grail of Organization may wish to skip the introduction to get to the nuts and bolts of this unique method. On Flickr you can find some annotated photos , which may be enough inspiration in themselves. So here is the first instalment, incidentally, one of the more difficult chapters for me, which may show in the writing. Being a nuts and bolts sort of person, the technical parts are a lot easier for me. Good time management practices and organisation greatly help in freeing up time to do the things you want to do. Unless you have exceptional memory and/or an exceptionally small amount of things to do, then you would almost certainly need tools for getting organised. The tools for planning could be as basic as a piece of paper and a pencil, or you could have an entire office at your command, including the most sophisticated computer software. The needs of most of us fall somewhere between those extremes. Do the tools of your choice help in implementing your choice of organisation system , or do they just serve to confuse? Are they completely inadequate? See how many you answer with yes. 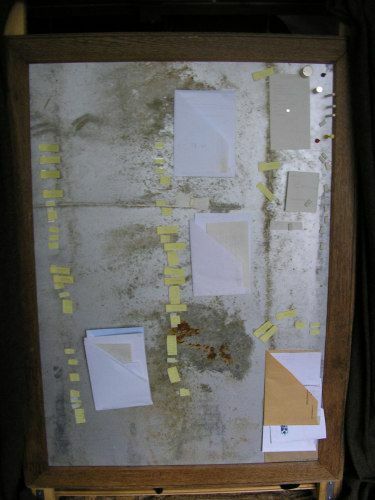 Does your memo board or fridge "magnet board" sport a haphazard collection of bills, notes, curiosities, kid's drawings, photos, telephone numbers, and magnets with no purpose beyond holding up the collection and perhaps adding a little decoration and the odd wise saying? (Make magnets work for you - learn how to later). Is your to-do list a scribbled mess with crossed out jobs and squeezed in additions? Do you look at your action/to-do list wondering where to start? Do you make more trips to the shops because you did not anticipate the need for an item through lack of planning or did not write it on a context (i.e. your shopping) list? Do you miss deadlines or appointments or rush around at the 11th hour? Does your to-do list resemble a naughts and crosses game with Xs and circled Xs, variously emphasised? Do you re-write and transfer your to-do list ad nauseum? Has poor planning caused expensive mistakes? Then you may find the answer to those problems in the slip method. You may even put fun into organisation . Please note, however, this is not a book about project planning and other processes. In it I illustrate the approach to such processes using slips and markers by means of some examples, i.e. the tools. The actual process is beyond the scope of this book. I will also write a little about organising to give some background information where necessary, and there are my own nuggets of information, tips, my opinions and heretical thoughts. Otherwise please refer to books or articles on organising systems. The slip method has its idiosyncrasies, and when using it with systems like GTD, for example, there is occasional need to diverge from either the system or the method where they clash, e. g. as in weekly reviews. In some cases I have my own take on elements of these systems, and will show an alternative approach. In order to answer that, you have to know where you are, what your situation is, and where you want to go to, and how. There are few places in this universe where you can't go at least in virtual reality with maps of galaxies, the solar system, Jupiter, Iona, the World or Hemel Hempstead. Wouldn't it be nice if there was a map you could use for organisation? Of course you can't buy one ready made, but using some of the trickery and shorthand cartographers use, you can create your own map. In the chapter on language I explain a little more about how the map type symbolism can be applied to an organising system. The bad news is, when creating your own map, you are not just cartographer, but also landscape architect. The terrain you travel has been, or is being created by you to some extent, though there are immovable features you have to deal with, and not least, you have to decide where you are going. All roads lead to Rome, as the saying goes. To find the best route, you may have to try out a number of them, maybe beat a new path, and the road most traveled will become the main route. Unforeseen obstacles may necessitate a detour, temporary or not, and, of course, you can cross bridges if and when you get to them. And don't forget, you can also choose the scenic route, and enjoy the journey, not just head straight for your destination. Also, allow for mood and energy. The bottom line - there is no organising system which works for every one in every situation. The good news is, that you are in greater control by being the designer of your system. If you treat all information on systems as building blocks, tools, inspiration, a design repertoire, you are less likely to be frustrated, if any particular aspect of the system does not work, just go back to the drawing board for a correction. It is also empowering to be more self reliant, in whatever form. Every thing you do for yourself is another step towards self reliance. Maps conform to a few basic standards of representation. A road map of the UK will look very different to one of Guatemala. A road map will look different to a topographical map. Different map types may use different symbols, though there are similarities. Using this metaphor, the terrain is your individual situation, the map type various organising systems, and the map with its virtual representation the tool which helps you to traverse that terrain. As life is more like an extended journey, you may alternate between driving on roads, walking the hills, or sailing the seas. No map will be the best one for your entire journey. You will have to use several for best results, maybe piece them together, you get the picture. So, whether you choose either GTD, Franklin-Covey, Get Everything Done , or any other system for most of your organisational needs, there are times when you have to dip into other systems, or improvise. The slip method is a tool which you can use to draw your own map. You can adopt or adapt any number of example tools, or create your own. You are the Boss. If you read the Acknowledgment, and link to the sources, you will see how looking to many diverse sources of inspiration can spark a new, unique system. Necessity is the mother of all invention, and the tools described in this book were developed through my own needs. I have achieved a fair amount of results with only the simplest of organising tool - a notepad and pencil, calendar and a basic filing system - but with increasing complexity in my work load, and decreasing energy I found myself in need of a more structured approach to organisation. I found much inspiration on the internet, snippets of information here and there, and put it together to create my own system, which is, of course, suited to my personal requirements. However, there are many tools I use, and some I developed, which can be used in many circumstances, and which I offer as building block for your own system. The Slip Method is a tool-use method, not a system. Some examples are based on well known techniques and systems developed or made famous through authors like Edward De Bono, Stephen Covey, David Allan, Mark Forster and Andrew Durham. The purpose of this book is not to parrot the work of these and other authors, but to illustrate the use of the slip method applied to these well known and tried and tested techniques. In the process you may, of course, learn some of those techniques if you are unfamiliar with them. The Slip Method is one list item or idea on one slip of paper, rearranged as needed into new layout, graph or list. The Slip Method reduces multiple ideas captured on one page to single ideas by subsequently cutting the page apart and moving each item into its appropriate location, and in some cases the slips are overlaid with additional information. 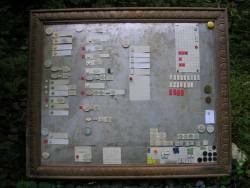 Ideally, the subsequent organising is done with a magnet board and the overlay information added in the form of magnets, although it can be done without, albeit with some limitation, and somewhat less flexibility. 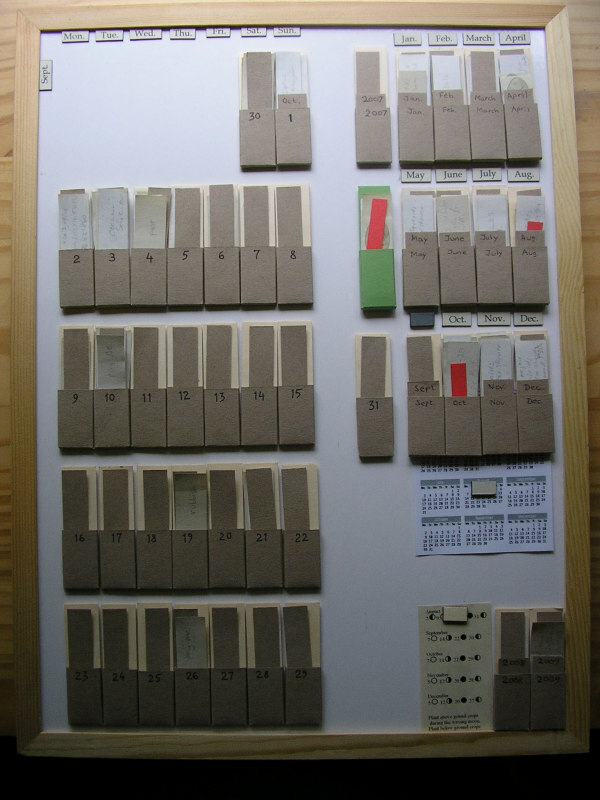 There are also special cases where it is better to use slips only, e.g. near computers and other magnet sensitive equipment. The method is designed to save resources (including money), and work in conjunction with many systems and techniques. It works with a to-do list, a tickler (and an annotated photo on Flickr) , mind mapping, diagrams , or writing an article, a book (and here) to name but a few applications. It allows for great flexibility and clarity. Materials are readily available and you probably already have the tools, at lest for the basic method. An extended use is condensing reference material from diverse sources into a mini, standardised reference library. If you want to get serious with the slip method, there are a few additional tools which would make the process easier, and I will show you how you can obtain bulk material at a reasonably low initial outlay, but which would set you up for a long time. The method does require a small amount of paper craft/DIY work, but I will give instructions which will be easy to follow, even for the most DIY challenged person. In part one you will learn about the hardware and its function - the paper, writing instrument, slip carrying surfaces, binders, folders or pockets, and the magnets. Part two describes the vocabulary of the information overlay and some hints on how to develop your own "language". This language can be used as a filter, so that part of the information can be ignored whilst more attention can be paid to the most relevant material as appropriate. In part three you will learn the process with numerous applications, both basic and advanced. There will be examples of applications from a simple to-do list or reorganising a memo board, to managing complex projects. Somewhere in between you can learn how to set up a tickler calendar and integrate the slip into the entire process from capture to execution . You will learn how to apply the slip method to problem solving techniques, and how it can help with special applications like creating genealogy or astrology charts. And why not take it further by turning your to-do list into a game to add some fun element (even make chores a competition between several members of your household), or embellish it to make it a piece of art? As William Morris said, Have nothing in your house that you do not know to be useful, or believe to be beautiful. In the final section I will give instructions for a number of DIY projects for organisation, and useful templates. You will also learn how to make or obtain the material for the slip method. When representing a non-linear, multi-layered concept in a linear format such as a book, compromises are inevitable. 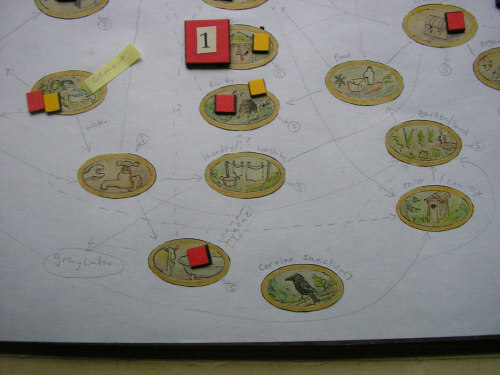 Yes, the content of this book could be represented in a large annotated diagram, but it would be impractical due to the work involved and the scale. I will describe the components in various chapters within the context of those chapters, so there may be a number of chapters containing a paragraph titled "The Slip", but each would look at a different aspect of the slip, and it would not be repetition of a previous paragraph, only so far as it would be necessary. For example, components of the system will be introduced early in order to give a basic idea about their role, and later I will write about how the component is used in the process in more detail. As I have mentioned earlier about organising systems in general, the same applies to the slip method; it is offered as a tool, inspiration, suggestion, and not a method to follow slavishly. Pick what you like, what works for you, a little or all, its up to you. And remember, this is a work in progress, even for me. When I talk of "office", it is in the broadest sense. It is the administration hub which organises the flow of goods and information - from memo board (on a fridge?) to a dedicated, fully equipped room, for private or business use. The system is the way in which the flow is organized, the method is the means by which it is achieved, the vehicle, i.e. the hardware used.